MAX6675 Thermocouple with Breakout: $3.96 CAD on AliExpress. The Arduino uses this to read the temperature during roasting. Coffee roasting temperatures are around 180°C — 240°C so make sure your thermocouple is rated high enough to handle this. Solid State Relay: I used a 40A SSR for controlling the heating element. 40A is probably overkill, but you probably shouldn’t use one less than 25A depending on the wattage of your popcorn popper. MOSFET Transistor: The Arduino digital pins didn’t have enough power to control the relay, so I used a mosfet transistor between the digital pin and relay. This might not be an issue depending on your relay though. Tape, Wires, Breadboard, Solder, etc..
That should be everything you need for wiring. If something isn’t working, it might be a good idea to troubleshoot circuits using an LED or multimeter. Also, please be extremely careful whenever working with the 120v circuitry of the popcorn popper. To setup the Arduino, simply upload the sketch using the Arduino IDE. You will need to add the MAX6675 library and this ModbusRTU library. You can install both of these using the Arduino Library Manager. Modbus is a serial communication protocol used in lots of industrial equipment, including many industrial coffee roasters. 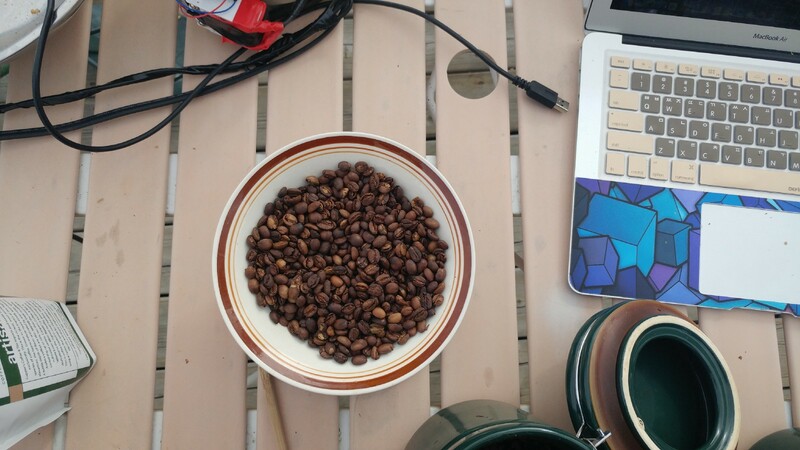 This project uses Modbus so that the Arduino can easily interface with Artisan RoasterScope software as well as any commercial coffee roasting software that supports the Modbus protocol. You might want to play with the kp, ki, and kd constants, although tuning PID controllers still seems like a dark art to me. You can also check out this pagefor some tips on tuning these parameters. Now, follow the steps below to load a roasting profile. During a roast, if you click the blue control box, the PID control will take over the slider and try to match the background roast profile as closely as possible. You can also play with some of the parameters to sync up the background profile with your roast. To design a profile from scratch, you can open the designer tools at Tools->Designer. If you live in a cold climate, such as Canada (where I’m from) it will be difficult for the roaster to reach high enough temperatures outside. A tip I learned here is to place the roaster in a box, so that the hot air being dispelled from the roaster is fed back into the air intake. This will help improve your roasts during winter. Previous PostPrevious Độ rang ảnh hưởng đến hương vị cà phê như thế nào?